The Pyunkang Yul Moisture Ampoule claims to be a high-potency moisture booster that calms, smooths and destresses skin for a glowing complexion. In a sophisticated and innovative product comprising a waterless formula of only 6 ingredients, Coptis Japonica Root Extract, also known as Japanese Goldthread, is present at a concentration of 91% and is the only active in the Pyunkang Yul Moisture Ampoule. High in antioxidants and anti-inflammatory properties, Japanese Goldthread exhibits soothing effects to the skin which is why it is often cultivated for medicinal purposes and used to treat skin disorders. It has a cooling sensation that helps to decrease skin temperature which can assist to balance facial oils, reduce redness and improve radiance. Its consistency is thick and resembles that of honey, helping it to better adhere and seep into the skin surface. Remaining ingredients are there to basically emulsify the formula. 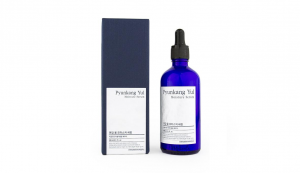 The Pyunkang Yul Moisture Ampoule is presented in an elegant blue glass bottle with a screw top dropper dispenser. 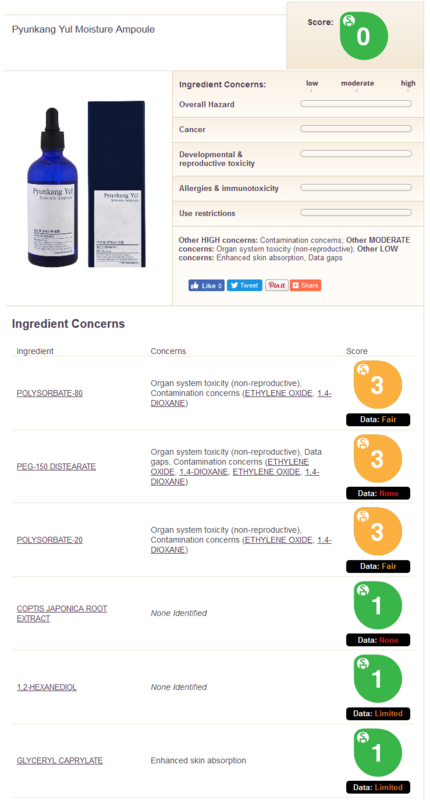 Both the CosDNA and EWG assessments conclude an ideal low hazard rating of 0 for the Pyunkang Yul Moisture Ampoule. Take a small amount and dot it onto forehead, nose, cheeks and chin. Rub your palms together to warm your hands first, then spread gel onto entire face. Gently tap and press until gel is fully absorbed. The Pyunkang Yul Moisture Ampoule has no detectable scent. 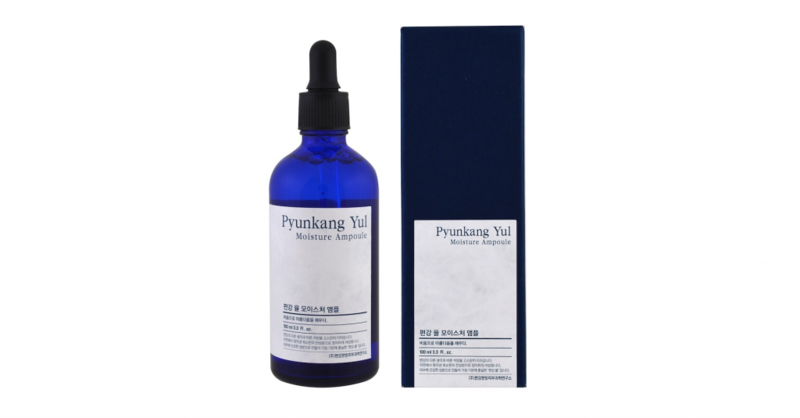 A 100ml bottle of Pyunkang Yul Moisture Ampoule has a recommended retail price of around US$28.00. 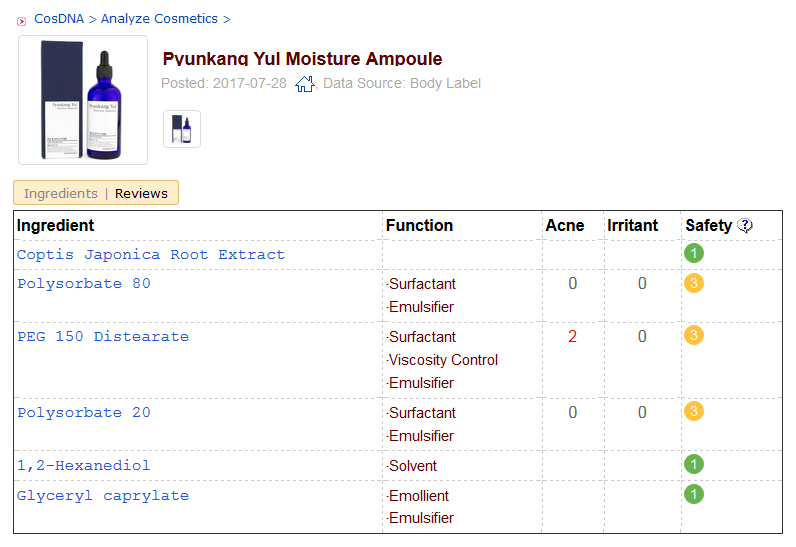 Pyunkang Yul products are available at Korean skincare online retailers such as Style Korean and iHerb. 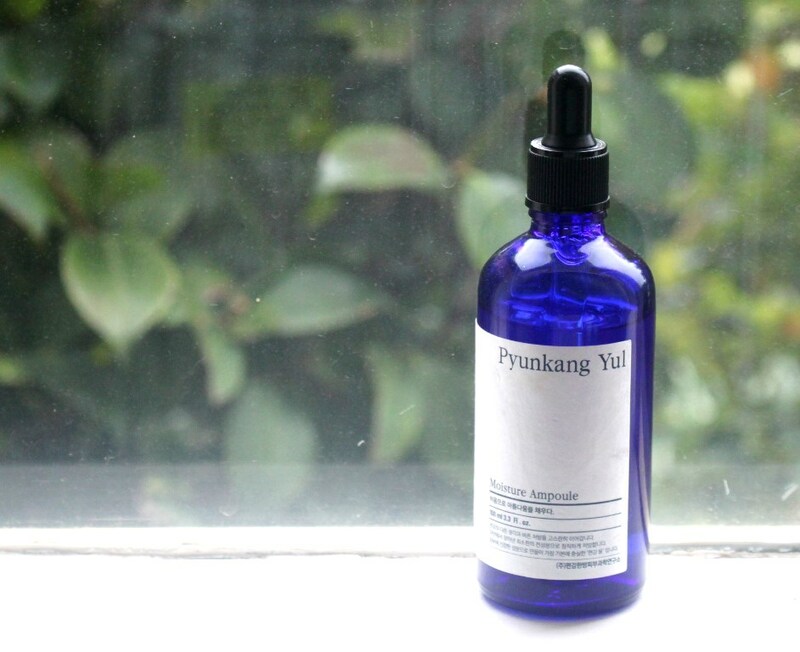 The Pyunkang Yul Moisture Ampoule has a two year shelf life and must be used within 12 months of opening. The moisture ampoule is presented in typical Pyunkang Yul fashion, now synonymous with the brand. 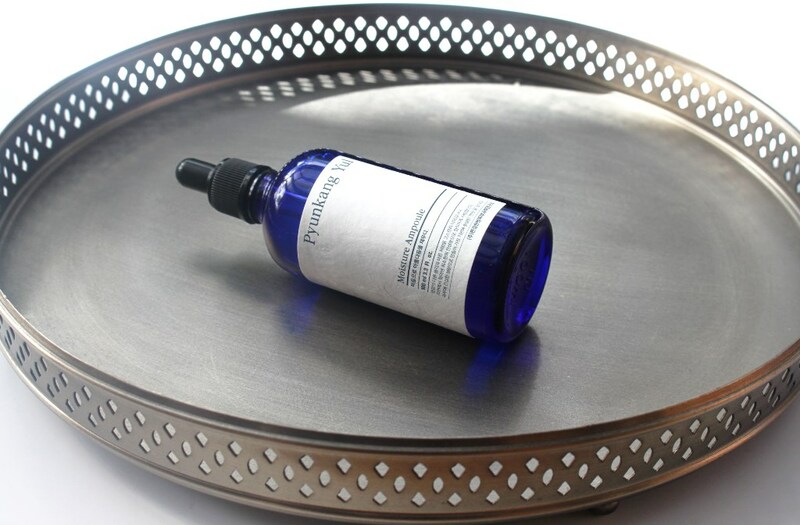 A 100ml dark blue glass bottle with screw top dropper lid is typical of their serums and minimalist labeling. Just like the Moisture Serum, the dropper is troublesome. It only draws the smallest amount of product each time instead of filling to capacity or thereabouts. Nonetheless, it works even though you need a couple of attempts to achieve the correct amount which in itself can be a little frustrating. This product is recommended for people with oilier skin while those tending to be dry or seeking anti-ageing benefits are advised to try the balancing gel which performs an equivalent function. 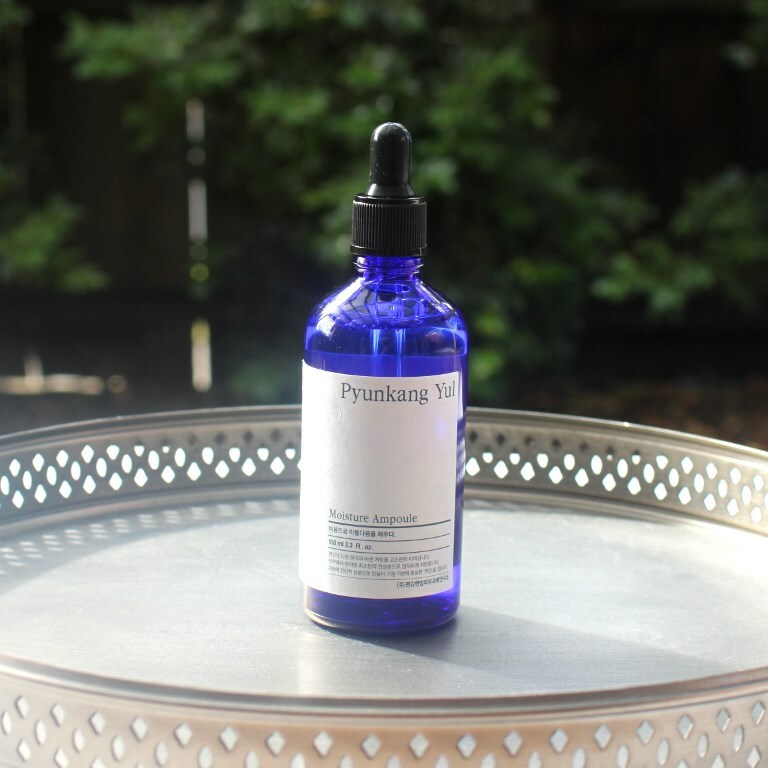 Like most of the brand’s products, this ampoule is fragrance free, always a welcome characteristic in my skincare. It is thick and honey like in texture although completely clear like water. Its viscosity is certainly a lot denser than a traditional ampoule. In fact, this is to be used more like a sleeping pack to seal in the preceding products and not prior to moisturiser. It is the last step of the skincare routine. Instructions advise applying a small dot of product on cheeks, nose, chin and forehead, rubbing hands together for warmth and then gently spreading it across the face, careful to actually pat and press the ampoule into the skin. The cooling effect is unmistakable and instant upon application. It is quite gooey and stretchy but does not leave behind any stickiness or residue as you might expect from such texture. In fact, I find that it melts into the skin in minutes. It acts as a sealant, trapping all your skincare in with a very thin occlusive cover. It prevents skincare from escaping, thus allowing it to act more effectively. Additionally, water loss is reduced by the seal it creates resulting in improved hydration and moisturisation retention. Pyunkang Yul advises using this in small amounts only. It is better to use it morning and night at the recommended dose rather than to layer it thickly in the evening. As it is a sealant, it doesn’t allow adequate penetration of products layered over it. Therefore, I use it as the last step at night time only. I don’t find that this product softens or moisturises in itself. In fact, looking at the science, there is no evidence that Japanese Goldthread exhibits such behaviour. To reiterate, its properties include soothing, calming, oil balancing and redness reduction. So let’s consider all four of these factors. For me, soothing, calming and redness are interrelated and observed simultaneously. Redness results from aggravated skin. Aggravated skin needs to be soothed of irritation and then calmed back to a normal state. The cooling effect upon application certainly provides instant results on this front. I don’t generally suffer redness although potentially because of this product, I have not experienced this problem during the trial period. As such, it’s difficult to conclusively attest to improvements in redness when they have either been prevented or not observed at all. I have combination skin with an oily T-zone. Apart from a little excess oil around the side of my nose, by morning the rest of my face feels well balanced, even after applying a full routine inclusive of a beauty oil. While testing, I used the Trilogy Rosehip Oil every night prior to cream followed by this sealant. Although called a moisture ampoule, this product neither behaves nor should be treated like a traditional ampoule. It doesn’t actually moisturise either. What it does do effectively is to act like a sleeping pack and seal in the goodness of the skincare routine. As a final step, it locks in moisture from preceding layers to maximise their benefits by providing a light occlusive protective outer layer. By improving the efficacy of the preceding layers and minimising moisture loss, it meets the moisture enhancement claim. It works well when it follows the brand’s Moisture Serum and Moisture Cream. It’s also a great choice for those with inflamed or irritated skin due to its ability to cool, refresh, soothe and calm. It is a lovely product, effective and extremely safe in terms of its formulation. Pyunkang Yul recommends it to those with oily to normal skin types.